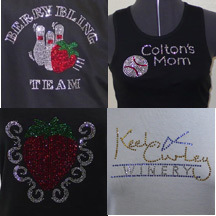 Custom Rhinestone Shirts from your artwork, mascot, logo or slogan. We also have stock rhinestone shirts available on the site in Junior & womens cut shirts. This month shipping is only $1.95 for your order. If you need a logo or something more detailed please fill out our custom form.